I’m late to plant my garden, but I don’t feel all that guilty. It seems I’m in good company, because all of nature is delayed this year. It’s like there was a huge traffic jam and team sunshine got caught in it. Oh sure, apologize, but we’ve all had to wait, so pale and patiently. Now we are late to the garden game. The tulips missed their tulip festival, the rhododendrons missed their rhody-fest and the snarl up made it all the way to my yard. But now that it’s June I am finally planted. As I went out to take a look today I noticed my garden was in full game mode. Check out my lively chive cheerleaders with their purple pom-poms. Go team! Herb planting can give you the joy of a big garden even if you don’t have a big yard. Any old pot will do. I love the ability to gather these delicious additions and take whatever I’m cooking from blandly routine to deliciously memorable. At Salty’s our chefs have spent their lives creating the delicious recipes that celebrate the wonderful world of herbs. Chef Jeremy uses them in pretty much every recipe he shares with us. Try out his suggestions in his blog, HERB-ilicious. 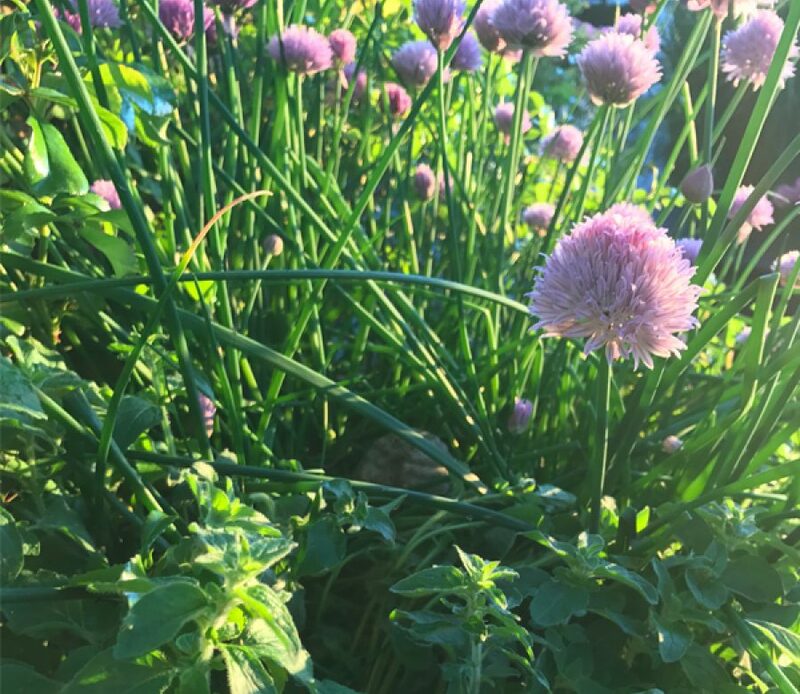 Here is a terrific Herb Gardening 101 site, created by one of my regular readers, that has excellent ideas on how to start your own herb garden with lots of herbal guidance you will surely enjoy. www.sproutabl.com. I’ll be cheering your garden on!